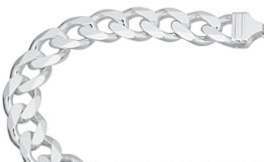 Sterling Silver solid Curb Bracelet 5mm gauge. Popular style curb bracelet with bevel edge diamond cut finish, approx dimensions 5mm wide 205mm length. Curb style links and lobster clasp. High polish finish.